The buck slip is a very annoying 5×7 form that he persists in perennially sending around to all of his senior staff. Basically, he writes (yup, with a pen) orders, instructions and more often than not attaches (stapled, of course) more or less relevant reports and documents. 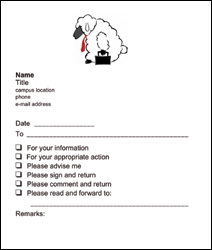 Staff names are already pre-printed, and the form is studded with various check-off boxes. I think you know the drill-‘FYI’, ‘Reply for_________Signature’, ‘Return Call’, etc. And yes, there’s also a comment section, as well as the sacrosanct due date and ‘high priority’ box. So not only does this guy persist in using this paper form in lieu of e-mail, or even a phone call, he also has the damned things sequentially numbered. The latest one I got was #72493. Ah, the method to this madness and anality is so that his secretary can assiduously copy and log these, so as to track who’s on time or who’s late in responding. Kinda like a bitchy Santa, keeping a list about who’s naughty or nice. So when one is granted an audience, or enters his office for a meeting, there my boss sits. Ensconced behind some large antique desk (that may be even older than him), he hunches over as he scribbles away at these buck slips. With what seems like the over-assurance and arrogance of some over-priced doctor, he tears the slips off the pad as if he were writing prescriptions. No, it’s not my imagination-he’s getting an almost sadistic satisfaction out of this! Ironically, I work for an outfit that literally prides itself on being ‘cutting edge’, ‘thinking outside the box’ and (holy of holies) so very green. Yet they continue to allow this guy to kill more trees than Paul Bunyan. Frankly, I don’t get it-do you? >The term was originally used (now I’m not surprised) by the military. >President Harry Truman (a World War I vet) had a sign in the Oval Office that said “The Buck Stops Here”. The thinking being that he ultimately accepted responsibility. Okay, but what’s my boss’ excuse?? ?